If I had to choose a favorite meal, it would be brunch! To me, brunch, more than any other meal, allows for the most creativity, resourcefulness and diversity. As far as ingredients are concerned brunch usually goes one of two ways in my house – It’s either envisioned on a bright sunny stroll through the farmers market, or scraped together with whatever scraps of food are left over in in the fridge. This would be the second type of brunch!! 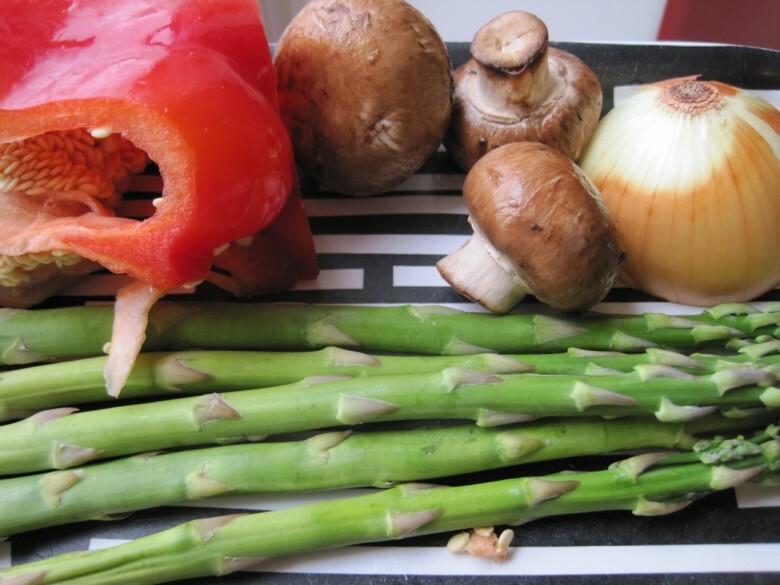 After perusing the shelves of the fridge I came up with a few stalks of asparagus, half an onion, some red pepper, three mushrooms, five eggs and some aged cheddar cheese. Preheat oven – you will be using the broiler. 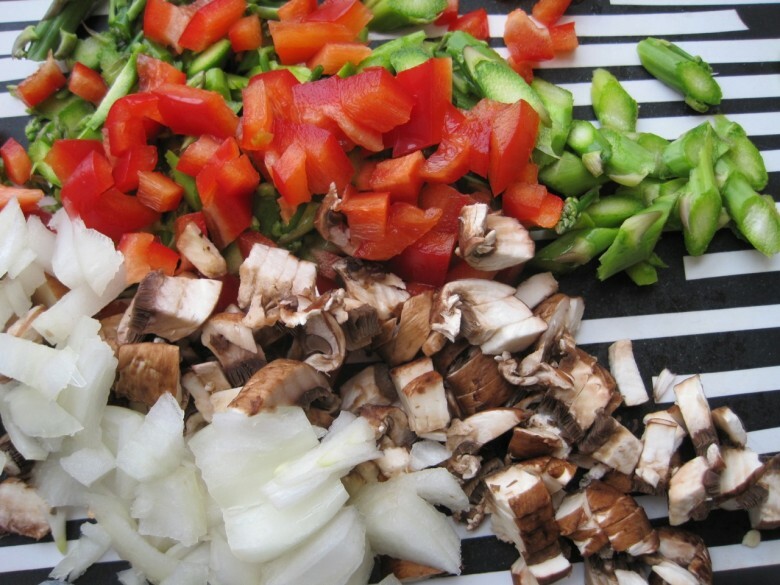 In an oven safe pan, saute the chopped veggies in a little bit of butter until soft. Crack eggs in a bowl and whisk together with a drizzle of milk. Grate some cheese into the eggs; I used a hard aged cheddar but Parmesan is also delicious. Note: use as many eggs as you want for the number of people you are feeding, I was cooking for two, so a smaller pan and 5 eggs were enough. Pour egg mixture over the veggies and mix. Mix the eggs around for a minute of so, you want the eggs to start to cook but not completely set. It should look clumpy, like half beaten cake batter (or like the picture below). Sprinkle on a little extra cheese if you like, and then transfer the pan to the broiler. Cook for a few minutes watching closely until the top gently browns. 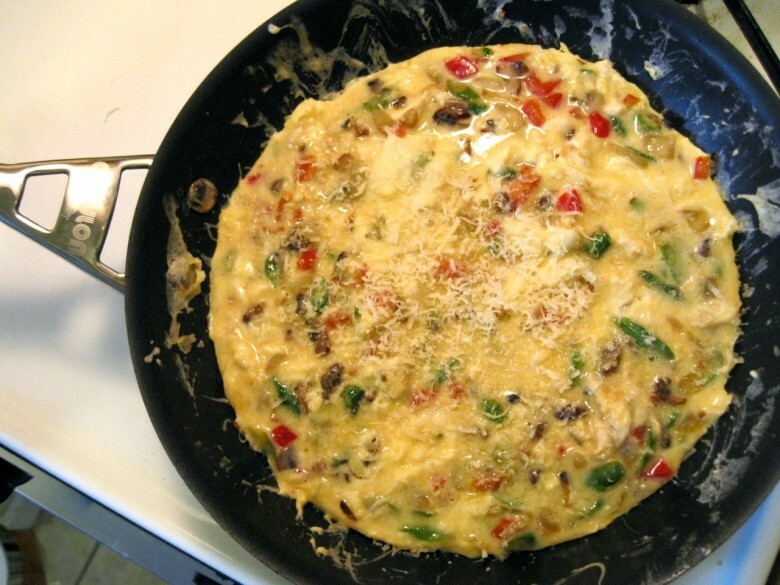 Remove, transfer the frittata to a plate to cool. Cut into wedges to serve. Today I served it with a side salad comprised of baby arugula, strawberries and a homemade balsamic vinaigrette. Total prep and cooking time, about 15 minutes! 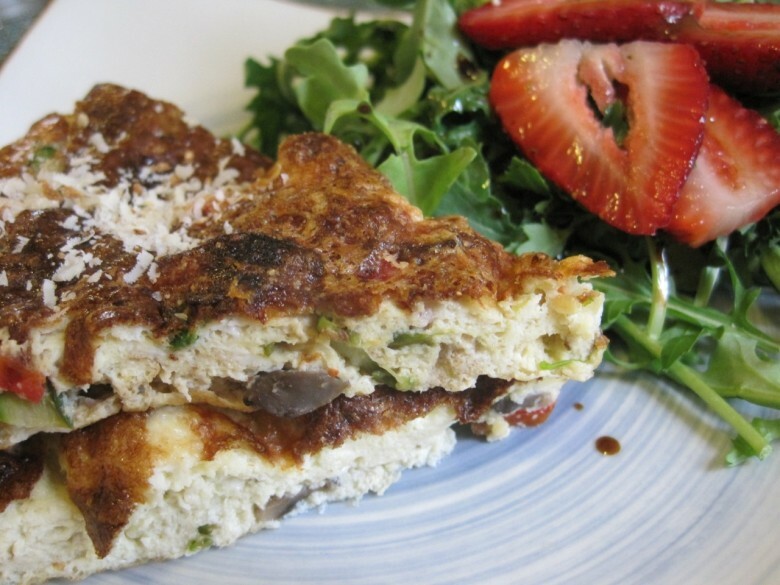 April 16, 2011 | Filed under breakfast, brunch, vegetarian and tagged with arugula, asparagus, breakfast, brunch, eggs, frittata, gluten free, kitchen rescue, mushrooms, pepper, salad, vegetarian, veggies.